Easter celebrates our resurrected life in Jesus, but can we understand resurrection if we don't journey to Golgotha and the grave? Make a commitment to draw nearer to God each day during Holy Week. The Rev. Canon Dr. James Walters, the Director of the Faith Centre of the London School of Economics preaches in a series called, "Praying the Passion." Apr. 14 at 8, 9, and 11 a.m. Our shouts quickly turn from "Hosanna!" to "Crucify!" on the journey to death and resurrection beginning on Palm Sunday with a sermon called Still Point of the Turning World. Childcare provided at 10:45 a.m.
Apr. 14 at 8 p.m. The progressive extinguishing of candles and sung scripture represent a descent into the darkness of the passion and in anticipation of the resurrected light at the Easter Vigil. Apr. 15 at 12:10 and 5:30 p.m. Mary, sister of Lazarus, offered Jesus the best that she had. Whether costly perfume or our commitment to be present at church this week, offer yourself on Monday in Holy Week. Learn about Generosity as Prayer from our guest preacher. Apr. 16 at 12:10 p.m. Bishop Jeffrey Lee invites clergy and lay people of the Diocese of Chicago to a half-day retreat preparing for Maundy Thursday, Good Friday, and Easter. RSVP online. Apr. 16 at 5:30 p.m. What does Jesus mean when he says that those who love their life lose it? Each day of Holy Week leads to the ultimate act of self-denial and how it can change your life and change the world. Sermon by the Rev. Canon Dr. James Walters called Dying to All the Globe. Apr. 17 at 12:10 and 5:30 p.m. Betrayed by a beloved friend, Jesus knows the pain of abandonment. As we hear the sermon called Close to the Heart, commit to be by his side in betrayal, death, and resurrection on Wednesday in Holy Week. Apr. 18 at 6:30 p.m. There is one day each year called "Maundy" or "mandate." What commandment has the power to transform our lives and change the world? "That you love one another, as I have loved you." Learn about Prayer’s Outward Sign in a sermon from the Holy Week guest preacher. Childcare provided at 6:15 p.m.
Apr. 19 at 1:30 p.m. On the cross, we see that love is self-emptying. From the cross, we are judged, and the verdict is forgiveness. Through the cross, God is with us in our suffering. Sermon from Rev. Canon Dr. James Walters called Thirsting for God. Childcare provided at 1:15 p.m.
Apr. 19 at 6:30 p.m. Le chemin de la croix by Marcel DuPré and the poetry of Paul Claudel are an artistic approach of walking the Way of the Cross. Performed by Director of Music Stephen Buzard and Carol Symes. Apr. 20 at at 8 p.m. Between crucifixion and resurrection is a time of remembrance. At the Easter Vigil, we remember that "in the beginning" we were called into being through love and that in baptism and resurrection we find hope in God's promise that "death no longer has dominion." Hear about Answered Prayers and Other Idle Tales as our guest preacher concludes the series "Praying the Passion." Childcare provided at 7:45 p.m.
Apr. 21 at 8, 9, and 11 a.m. Love is stronger than death! Easter shows that only death will die and that we are called to resurrection life now and into eternity. Childcare provided at 10 a.m.
Eucharist at 8, 9, and 11 a.m. Morning Prayer at 8:45 a.m.
Eucharist at 12:10 and 5:30 p.m.
Eucharist & Foot Washing at 6:30 p.m.
Liturgy of the Passion at 1:30 p.m.
Music & Poetry at 6:30 p.m. The Rev. 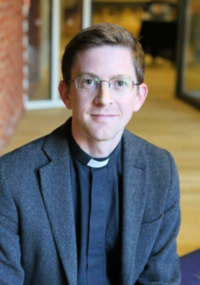 Canon Dr. James Walters is the founding director Faith Centre of the London School of Economics and leads its work in promoting religious literacy and interfaith leadership among the student body, the government, and to the world. He has written several books, including Religion and the Public Sphere: New Conversations and Loving Your Neighbour in an Age of Religious Conflict. He is a canon of Chichester Cathedral and represents universities on the General Synod, the Church of England's governing body.